This week it will be November. This time of year feels really magical to me, not because of fall leaves, crisp air, and pumpkin-flavored everything, but because I absolutely love what is coming around the corner in January. I don’t know what 2018 was like for you. Maybe it was full of success and celebration, one of your best years yet. Maybe it was full of challenges, disappointments, and setbacks. Or maybe it was a mix of both. For me, 2018 was a steady uphill climb, with a few stumbles into some big lessons learned. Regardless of where you have been, intentional goal-setting is one of my favorite tools to get closure on what has happened in the past and move toward the results we want from the future. It’s one of the reasons I created the Thrive Program, my planning + goal-setting program for creative entrepreneurs. As we go into our 2019 goal setting, we need to have our eyes wide open to the things that have the potential to derail us. In this post I’m walking you through the top five mistakes I see creative business owners making in their goal-setting, and how you can avoid them. I want you to head into your holiday parties and vacations with a solid set of goals for 2019 that set you up for success. Because of this, I created Thrive in Five, a totally free goal-setting guide for creative business owners. Check it out here! One of the classic mistakes that new CrossFit coaches make is throwing too many cues at their athletes at once. “Eyes up. Back straight. Shoulders active. Elbows locked. Feet together.” You can imagine what it feels like to be on the receiving end of a barrage of instructions like this. Good coaches learn quickly that when you try to fix everything at once you end up fixing nothing, and even worse, confusing and discouraging the person in the process. This is how a lot of us approach goal-setting. We set goals for everything that needs fixing, everything that can be measured, and everything on our business bucket list. By the time we are finished, our list of “goals” is as long as a CVS receipt, and is even less useful. One of the main benefits of goal-setting is to give you focus in a world that can feel chaotic and distracting. To help you focus, you should limit yourself to a few annual goals (between three and seven) that reflect your most important business priorities and metrics. 2. Setting goals that aren’t aligned. I had one client this year who was in the early stages of her interior design business, and she set a goal to work with at least 10 clients. The intent behind the goal was to gain experience and build a portfolio. About halfway through the year, we realized that this goal was fighting with one of her other goals: to hone in on her ideal client and ideal project. She needed to get past the portfolio-building, experience-gaining phase before she could get pickier about what kinds of projects she would take on. Some of you have things that you want to accomplish this year that might not be compatible with each other. For example, If you want to create an online course, you might not be able to increase your client workload. Make sure you carefully evaluate whether your goals are in alignment with each other. 3. Setting only aspirational goals. 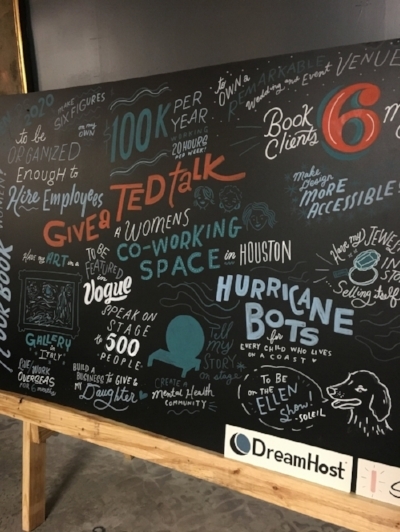 During one of the sessions at VenturePop, we all wrote down a dream that we have for our business, and a local artist hand-lettered them beautifully onto a big board (shown below). Having these kinds of big, long-term, aspirational goals is important to stay inspired and persevere in difficult seasons. I set these types of goals, and I write them by hand periodically in a journal. I’ve even incorporated this concept into my Thrive Program curriculum. But, if you only ever make long-term aspirational goals, and not short-term strategic goals, then you won’t have the kind of guidance and direction that you need to be effective in the day-to-day. It’s great that you want to be featured in Martha Stewart Weddings 10 years from now, but you also need to know what you need to do this year in order to get there. In addition to lofty, aspirational goals, you should set short-term strategic goals that reflect the most important things you want to accomplish in the next 12 months. 4. Setting goals that aren’t connected to your business model. In spite of all this success, there was one goal she didn’t meet: the number of Instagram followers she wanted. There’s a huge lesson to be learned from this. Many of us are paying too much attention to metrics that aren’t connected to the results that really matter in our businesses. I’m as guilty as the next person of obsessing over my social media followers, e-mail list subscribers, web traffic, unsubscribes, and other metrics that, at the end of the day, don’t really have much of an impact on my business’s actual, financial results. Before you measure your success according to a certain number or metric, you need to understand how that metric is connected to your business model (aka real, actual profit). That’s not to say every single goal needs to be financial, but you need to understand how it will impact your finances. 5. Not staying committed to your goals. At the beginning of 2017, I set a goal to improve as a runner. I use the term “runner” loosely considering that the first step I had to take toward this goal was to buy my first-ever pair of running shoes. By the time June rolled around, I had everything settled. I had taken the summer off of CrossFit, so I definitely had the time to focus on it. I bought AirPods. I downloaded Strava. I started running a few times per week and I didn’t hate it. I actually made a tiny bit of progress before I hit a figurative wall and quit. The surface-level reason that I quit is because the weather turned downright sticky and it wasn’t suitable (by the standards of me or any sane person) to run outdoors. But, when you dig a little deeper, the real reason I quit is because I wasn’t that committed to the goal in the first place. Review them and take action once per week. Take a half-day once per quarter to evaluate your progress. I’ve created a goal-setting guide to help you avoid these mistakes and get a jump start on 2019. Check it out here.